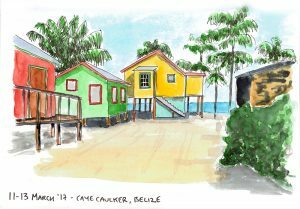 Honduras & Belize | Travel Sketching & Illustration - Explore My Sketchbook! 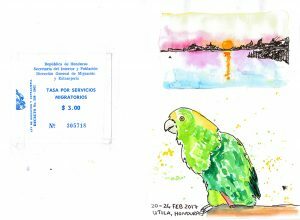 I have put Honduras and Belize together as I was only in each for a few days and I did not get too much sketching done. In Honduras, I headed straight to the island of Utila. I did this because I wanted to learn to dive and Utila is the most affordable place on earth to do the PADI course. Turns out I actually did not like scuba diving very much, but hey, I tried. After Honduras, I went to Nicaragua to meet a friend a console myself that I sucked at diving! I then returned to Guatemala, and after that, I went to Belize. Again I made my way through the country and headed straight to a tiny little island off the coast called Caye Caulker. Wow. Just wow. That is my kind of place. I had a lot of fun there and I appreciated the Carribean vibe. I did some snorkelling (much more within my comfort zone), I ate some barracuda straight from the barbeque and I jammed on a two-string homemade bass guitar with a dreadlocked dude on the beach. I loved every moment, ok, apart from the extreme sunburn I had on the back half of me…turns out when you snorkel your back is the part that requires the sun lotion. Don’t just put it on your front! Oops.